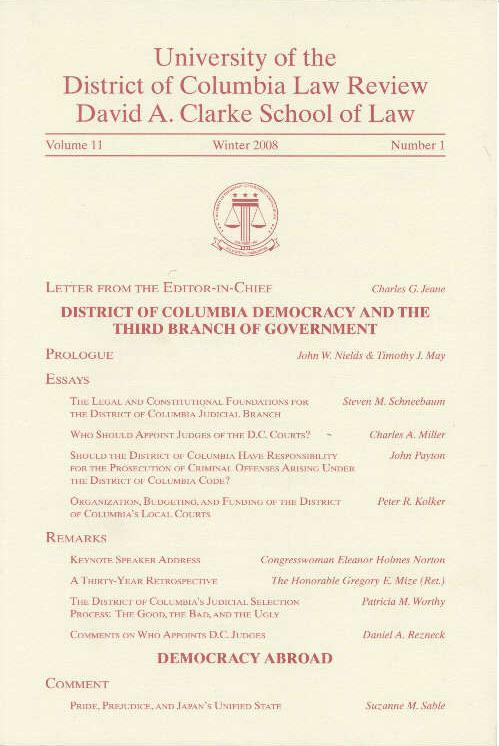 District of Columbia Democracy and the Third Branch of Governmentâ€“ Who Should Appoint Judges of the D.C. Courts? Written by Charles A. Miller. District of Columbia Democracy and the Third Branch of Governmentâ€“ Should the District of Columbia Have Responsibility for the Prosecution of Criminal Offenses Arising Under the District of Columbia Code? Written by Peter R. Kolker. DC juvenile cases are being resolved quicker due to DC Speedy Trial Juvenile legislation enacted in 2008. The report found that the DC juvenile justice system achieved a high rate of compliance with the speedy trial deadlines and with reducing the time juveniles spent in secure detention following an order to shelter care. Even after dramatic improvements in the performance of the District of Columbia’s child welfare system, DC foster children still spend multiple years in temporary care before finding permanent homes. In addition, two hundred children have left the system in each of the past two years without ever finding a family. "Expungement" is frequently the term used for the process of erasing an individual's criminal record – the official records regarding arrests and/or a conviction -- to afford citizens the opportunity to put past contact with the criminal justice system behind them. The Council for Court Excellence (CCE) undertook to address the subject of expungement and to prepare a report that would summarize the existing state of the law, discuss key issues, and set forth options that the Council of the District of Columbia might wish to consider in enacting legislation on the subject. Download the legislation here. This report by G. Thomas Munsterman of the National Center for State Courts, presents concrete steps to expand citizen participation in jury service. The report describes the current process by which District of Columbia citizens are summoned to jury service, and it suggests governmental reforms to increase the proportion of summoned citizens who actually serve. The report is a comprehensive analysis of the District of Columbia's system for providing lawyers to represent all children and indigent adults in child neglect court proceedings. Such representation has been guaranteed by DC law for twenty years and is a far more comprehensive legal safety net than in many jurisdictions in the nation. 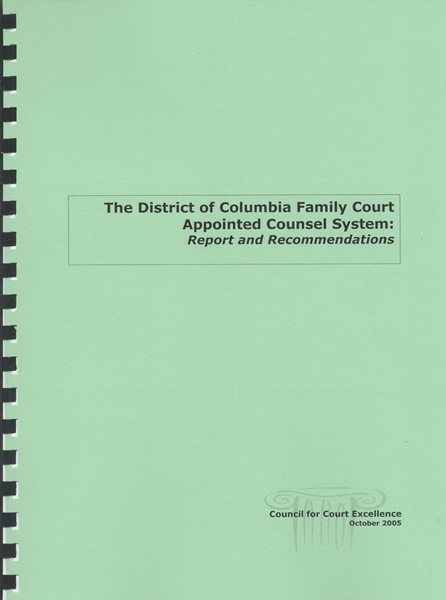 This CCE report builds on four studies published by the DC Bar since 1975 of Superior Court appointed counsel systems for criminal and family cases, and it traces the results of the most recent of the four studies, the Muse Report of 1993. 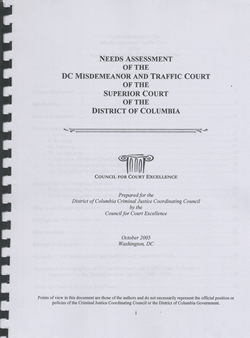 In September 2004, the Council for Court Excellence received a contract from the DC Criminal Justice Coordinating Council to perform a needs assessment of the DC Superior Court DC Misdemeanor and Traffic Court. This Court is one of two community courts created as a result of a recommendation by the Council for Court Excellence and the Justice Management Institute publication A Roadmap To A Better Criminal Justice System (April 2001), which can be downloaded here. This report is the fruit of the project that was developed by CCE's Public Service Committee. It is the first observation project of a federal courthouse in the nation, and third court observation project overall for CCE. The previous two projects in 2001 and 2002 were held at the Superior Court of the District of Columbia's criminal and civil divisions.